After spending lots of time searching for my favorite Vera Bradley diaper bags on sale each and every time the season changes, I have decided that team effort is the best time saver. I'm sending a shout out to all fans of Vera Bradley baby bags to share their coupon codes, contests and discount sale information. If we all work together we can have a never-ending supply of our favorite patterns at knock-off prices (not that we would EVER buy fakes!) and find those accessories in retired patterns that we are lacking without spending hours and hours online looking for them. Go here to see more Vera Bradley baby items in patterns to match your diaper bag. Vera Bradley fabric is beyond compare when it comes to vibrant color and pretty patterns. 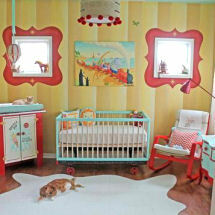 Chances are that there will be one you like no matter what color scheme you have chosen for your baby's nursery. If you have read many reviews of Vera Bradley baby bags, you know that the main feature that moms love is the quilted fabric. It's crisp and lightweight and the colors are bright and bold; what more do you need? There are a few features that some of us would like to see that are missing. If you would like to see more zippered compartments or a matching changing pad...fill out the review form below and hopefully Vera and friends are listening. Do you have a favorite Vera Bradley diaper bag? Do have a coupon code or know about a sale! Tell us about it! At one time, Symphony was my "must have" pattern and then I fell in love with the Purple Punch diaper bag. And by the time anybody gets around to reading this article, my taste may have changed several times. It's true that I'm fickle about style and color but it's doubtful that I will ever lose my passion for a beautifully made, lightweight diaper bag that makes me feel like (and look?) like a million bucks when I'm carrying my baby's stuff in it.